Last Friday was the first Bread Angels pilot. Bread Angels, for those who don't know, is the social franchise part of the Virtuousbread.com social enterprise. A lot of jargon, I know and what it comes down to is that Virtuousbread.com (the social enterprise) seeks, as part of the million things we want to achieve, to have a network of home bakers up and down the land who bake at home, earn a bit of money, supply good bread to their communities, and in so doing, actually meet their neighbours and build their communities up. Because we cannot train everyone, we have just established a programme of "train the trainers" and have four future trainers working together with us on a pilot training scheme. Joanna has raised four children and became very interested in nutrition when her husband had a heart attack. She leads the transition effort in her home village and is dismayed that it has become so "gated" with fearful people living in grand houses behind walls that cut the off from one another. One day she will open a bakery and until then she wants to use bread as a way of building relationships in her village. Rosie is a health care professional who, only now, appreciates how much she learned about cooking and nutrition when she was at school because she compares her lessons to those received by her children at their school. Learning how to make wraps and muffins in their state of the art facilities, with virtually no accompanying lessons in nutrition is not preparing her girls for their adult lives. Rosie wants to teach people how to set up home baking businesses because she wants to move food and nutrition up the social agenda where she lives. Claire started the gardening club in her children's school and was amazed that many of the children did not know that carrots grew in the ground. She sees the links between food on a plate and food at its point of origin are weak and need to be built. The interest in gardening has become an interest in food generally and she wants to strengthen her ties into the community by baking bread and teaching others to do so. Alison started out her career as a picture framer, something that she loved, but was forced to change direction and take a series of office jobs which did not inspire her. She founded an organisation called Dirty Hands and brought allotment gardening to an empty lot on the houseing estate where she lives. Feted by Boris Johnson and asked to support other allotments schemes, she realises how much building communities means to her. Baking, providing bread, and teaching others to do so is something she believes will be both fulfilling and important. Kneading bread, talking about farming, milling, and baking methods; shaping bread, talking about flour, nutrition, health, and different kinds of bread. Baking bread, eating lunch, talking about our expectations of each other both during the pilot and afterward. I prepared carefully, deciding what bread to bake, writing down all my knowledge about bread, packing up ingredients, equipment, and lunch. But I was too ambitious. I decided to take the bread tins out at the last minute and show how it is possible to bake bread without tins, without measuring, without any expensive kit. It is, of course it is. But it is only if you have the experience to know what dough feels like when it is kneaded, what it looks like when it is risen, and how to shape it so that it holds its shape. As ever, too ambitious, too eager to look like a magician, I neglected to understand that what they really wanted was to bake a perfect loaf of bread. Perfect in the way that bread has been baked in this country for years: in a tin, a square loaf with a domed top, and evenly distributed small bubbles in the crust to hold the butter and the ham, the spread and the jam. I regret taking the tins out of the bag. Yes fine, a lesson learned. But that does not make me feel any better. I read the article about Virtuous Bread in yesterday's Independent and am very interested in becoming one of your "angels". Where and when could I attend one of the training sessions? And what would it cost? 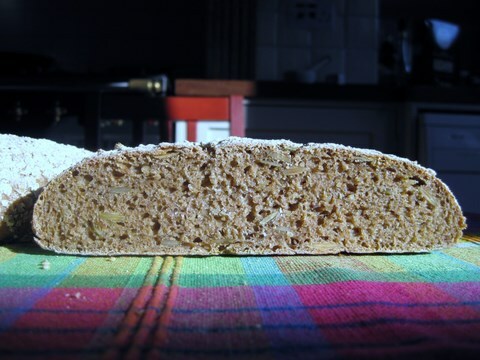 I have just started making my own bread because it is becoming increasingly difficult to buy good, nutritious bread locally. I have been into healthy eating all my life, and would love to get something going and encourage others to eat good bread down here in Devon.